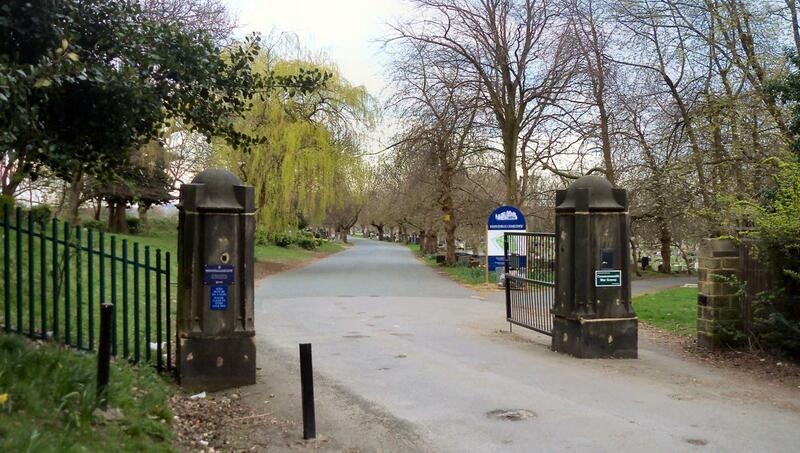 On the way home from Scarborough I came off the motorway and headed up to Harehills Cemetery in north east Leeds. Branches scraped across the top of the motorhome as I drove into the centre where a chapel sits. I didn't get out as there was a woman sat by a crying audibly. I'm sure she saw me as she sunk into her thick coat and pulled up the hood. I switched the gas on and boiled water for coffee. I didn't want to embarrass her and thought I'd have a drink and a read the paper. After fifteen minutes she was still there, red-eyed and snotty-nosed and crying hard. I got out and asked if she was okay and her head protruded from the hood. She was okay - as much as you can be when your 17 year old son had been stabbed to death. The sobbing stopped more from diversion than anything. I asked if she wanted a coffee and a Twix but she said she had to get home, was okay and visited the grave regularly. The murderer was in prison but "it didn't bring my lad back." It being Mother's Day justified a good blub I suppose. When she asked why I was in the cemetery I lied and said I was looking for a relatives grave. It would have been unkind to say I was seeking one of the Yorkshire Ripper's victims who'd been murdered aged 16. The cemetery's sprawling size meant it took about twenty minutes to find this grave. Thankfully I had a photograph with two high-rise blocks in the background which guided me to the right area. 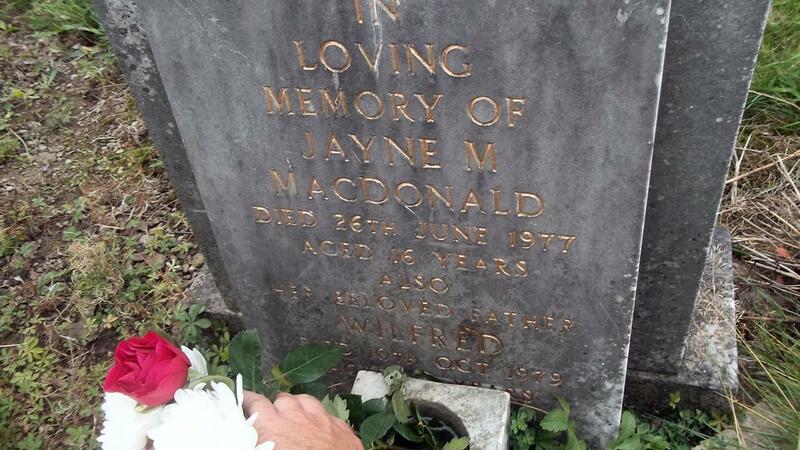 Here I am at Jayne’s grave and she’d buried here with her dad. He died only two years after the murder having never recovered from it. Losing a child must be terrible but losing one to violent murder must be worse. I can remember the five years when Peter Sutcliffe (the Yorkshire Ripper) was roaming free. He preyed on vulnerable prostitutes in red light district but Jayne became the first murder victim who was not a prostitute. This sent a new wave of terror across the north as now no woman was safe. Across in Bradford Peter Sutcliffe had spent the night in pubs with another couple. He dropped them off by rather than going home he headed for his "hunting ground" in Leeds. He had killed four women so far. At about 2am he spotted Jayne walking on her own up Chapeltown Road. He parked the car and watched her for a few minutes before getting out with his claw hammer and kitchen knife. Later he said he thought Jayne was a prostitute as this was a red-light area and seen her stop and chat to some streetwalkers. Near an adventure playground he bludgeoned Jayne on the back of the head with the hammer and dragged her, face down, into the corner of the play area (he later said her shoes made a "horrible scraping noise".) He hit her with the hammer again, pulled her clothes up and stabbed her about twenty times in the chest and back. The next morning two children found her face-down body, her skirt disarranged and her top pulled up to expose her middle. Blood smears on her back showed Sutcliffe had tried to wiped his knife clean. A broken bottle with the screw‑top was forced into her chest (later Sutcliffe claimed this must have happened when he dragged her through the playground.) Later there was a flash of remorse when he said, “When I saw in the papers that MacDonald was so young and not a prostitute I felt like someone inhuman and I realised that it was a devil driving me against my will and that I was a beast." I took a few photos (with a man and his husky dog watching me.) Poor kid - she wasn't long out of her school uniform. There was a large group of Pakistani men further down the cemetery. I'd seen cars pass through the cemetery but thought it was a shortcut but they were all surrounding a grave, so consumed they didn't once look up at me saluting. I did a hearty salute and left. The crying lady had finally gone home.